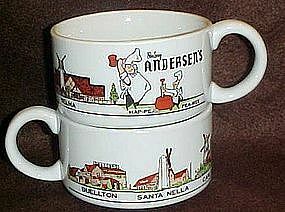 Large soup mugs from the famous restaurant Pea Soup Andersen's. I have shown both sides in the photo, and they are stackable. Measures 2 3/4" deep and has a diameter of 4 1/4". Bottom stamp is KWC in a diamond. Shows restaurant's from Buellton, Santa Nella, Carlsbad, and Selma. Perfect condition, and I have 2. Price is per item.